Three bands are grouped together, and a fourth one runs parallel. The latter is identical to the central band of the group of three. It contains inverted hook motifs, eight-petalled flowers, and small triangles. The two bands on either side of the central one are narrow and contain small darts and s-shapes. 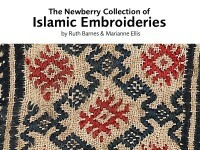 The embroidery provides the background. 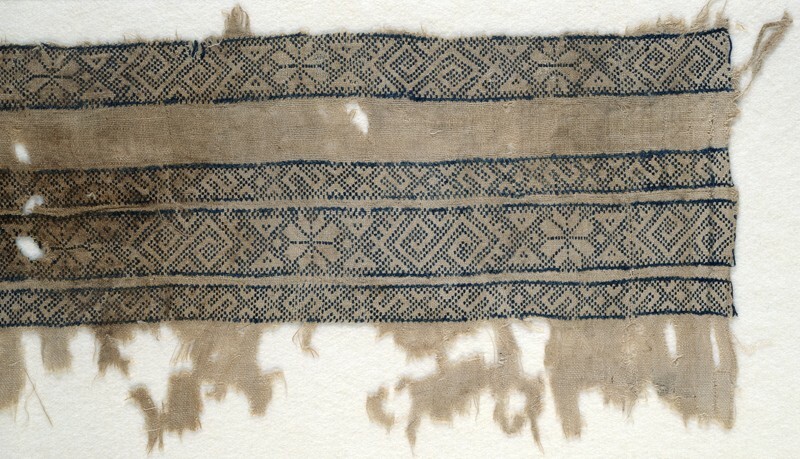 The patterns on this fragment are almost the same as some worked on sampler No. 24 [EA1984.490]. The most noticeable difference is that eight-pointed stars alternate with S-shapes on this embroidery and with Zs on the sampler. 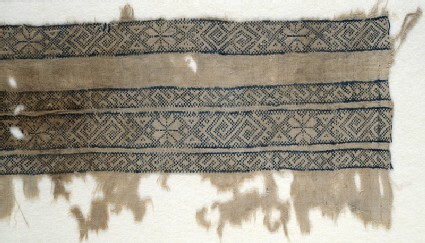 It is interesting to see how the decoration has been built up, presumably from a sampler like No.24, by selecting two narrow bands to lie on either side of the wider one and then repeating the wide one again for emphasis. The narrow bands balance each other with S-shapes on one and Z-shapes on the other. This predilection for symmetry is one of the hallmarks of Mamluk embroidery.